EU leaders pushed back Brexit day to April 12 after meeting May in Brussels last week. 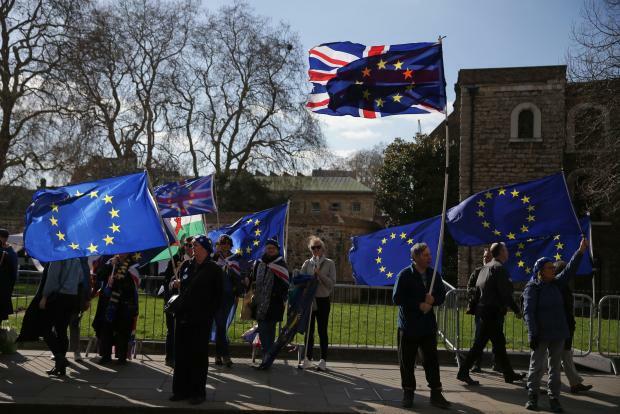 Britain's parliament sought a new Brexit strategy Tuesday after seizing the initiative from Prime Minister Theresa May in a historic vote, with the risk of a chaotic "no-deal" departure looming. Lawmakers exasperated by Britain's failed efforts to find a way out of the European Union after three years of debates and negotiations voted Monday to give themselves a broader say on what happens next. Richard Harrington said he resigned as business minister because May's approach and the resulting impasse had left Britain with "a democratic deficit". Junior foreign minister Alistair Burt also quit, saying: "We have to come to a conclusion for the country's sake". The Times newspaper said the vote left May "humiliated" and bracing for early national polls. The Financial Times agreed that Britain's leader now "risked losing control of Brexit". "The first time round it will just be 'here are the propositions' and you vote for as many as you would like," Benn told BBC radio. "We may then change the system for next week as we are trying to narrow it down." The biggest worry for May is a mooted plan for parliament to then in the following days take an even firmer grip of the Brexit agenda by passing legislation that forces the government's hand. Everything is back on the table and May's deal - twice resoundingly rejected by lawmakers this year - is just one of a half-dozen or so approaches that may be up for debate. May herself admitted "with great regret" Monday that there was "still not sufficient support in the House to bring back the deal for a third meaningful vote". Brexit hardliner Jacob Rees-Mogg, head of the European Research Group of eurosceptics, said on Twitter: "The choice seems to be Mrs May's deal or no Brexit". But the tiny Northern Irish party that supports her in parliament, DUP, continues to oppose the agreement and it remains unclear when - or even if - May will bring it back for a vote.